Cover Reveal: Such a Dangerous Game! I can't believe the day is here! It's time to reveal this gorgeous cover. I've had it on my computer for over a year, and it's been SO HARD to keep it to myself! I present the third and LAST BOOK in my Stolen Tears series - Such a Dangerous Game! Talon has betrayed his people. Now he must atone for his broken oaths and marry a woman he doesn’t love, or face banishment forever. Ambry is the last of a lost race that possesses all traits of magic. Desperate for answers about her true heritage, she travels to Arcaia, resigning herself to the fact that she and Talon are not destined to be together. The cards presented to her by the Seer, Jomeini Straylark, offer little in the way of answers, until Ambry discovers they aren’t just cards that divine her future. They’re part of a game of destiny, a long lost access point in gaining command over an angelic army, one powerful enough to wipe out an entire race. If Ambry and Talon want any hope of stopping the Arcaians, of freeing their people trapped in gemstone and releasing their magic, they must play their hand in the game. Hearts must break. Blood must spill. And if the game isn’t played right, they could lose everything they hold dear. Hearts clash, worlds collide, and even the best intentions go wrong in this heart-pumping final installment in USA Today bestselling author Cortney Pearson’s Stolen Tears series. 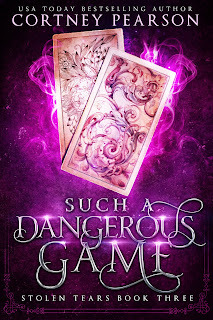 Such a Dangerous Game is coming September 3, 2018. Preorder your copy today! Grab it here on Amazon! Sigh. I can't get over the climax of this story and just how perfectly it's come together. I have to give a huge shout out to my editor, Charity West, for helping me plot and figure out so many details that needed to take place. She kicked some serious booty with the plot for this story. Credit also goes to Rebecca Frank for her gorgeous redesign of my series. She did a fantastic job! Look how pretty they are all together! 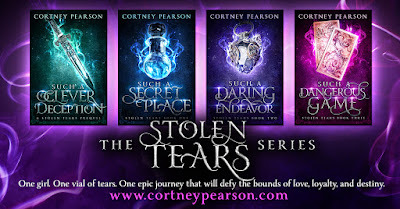 If you haven't started the Stolen Tears series yet, you're missing out! Check out the books below! Thanks so much for reading, and for joining me in my writing adventures! I have soooooo many amazing updates happening soon, and I can't wait to tell you about what's coming up next!